As many of you know La Bricole, a forum solely devoted to Napoleonic Wargaming is running their second painting contest. This one is to honour the Battle of Salamanca which just passed it's 200th anniversary. Anyone is free to enter, and the rules are here. The competition entry has to be a Napoleonic vignette. For my entry to the Salamanca Challenge, I plan to paint the Baron Larrey set from Warlord Games. I got this set a couple of months ago and I have been trying to figure out since what to do with it. It really does not fit as a causality marker and I like all my stands to have some gaming utility. Most of the rulesets, I use have some sort of measurement of army morale and I wanted a stand to represent this. I have not really thought it out completely but I am envisioning this stand coming out when things are getting bad for an army. As most of you know, Schrumpfkopf has had some Prussian medics commissioned as well as an ambulance. I had been thinking what to do with these and happened upon the morale stand idea. 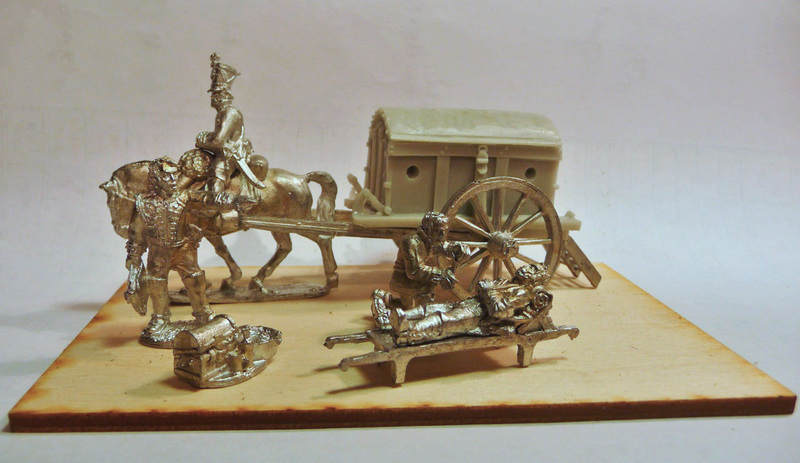 Unfortunately the Prussian ambulance is not yet available, but the Warlord Games set will be an excellent substitute. If I have time I will also submit a French Divisional command stand (Prince Jerome) to the competition, but I really want to get 4 more points of SAGA done as well as the last 2 battalions for my Hanoverian brigade, so probably will not happen. This is a 120x80mm stand, I really could not have used smaller, the size will match my other command stands. 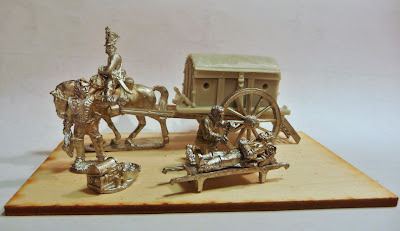 Any other thoughts on how to use these "ambulance" stands in wargaming would be appreciated. You scooped me on this one, John! I picked this up at Salute this spring and was playing with the idea of submitting it for the competition - curse you! ;) I'll see if I can dream something else up... Nonetheless, I look forward to seeing this get done by you - have fun with it! Looks a really nice set, can't wait to see it painted up. Sorry about that Curt, but I am sure you will come up with an equally interesting entry. Curt, why not enter the ambulance? No reason why we cannot have two identical entries- in fact, it's always interesting to see how different painters tackle the same subject. I have an old Minifigs "Larrey" ambulance; it comes out when a general is a casualty! A lovely little set, look forward to seeing this painted up. Possibly the best Warlord napoleonic offering so far. Very nice set.